Use the Alerts Manager window to set visual, audible, and email alerts based on a number of configurable values. 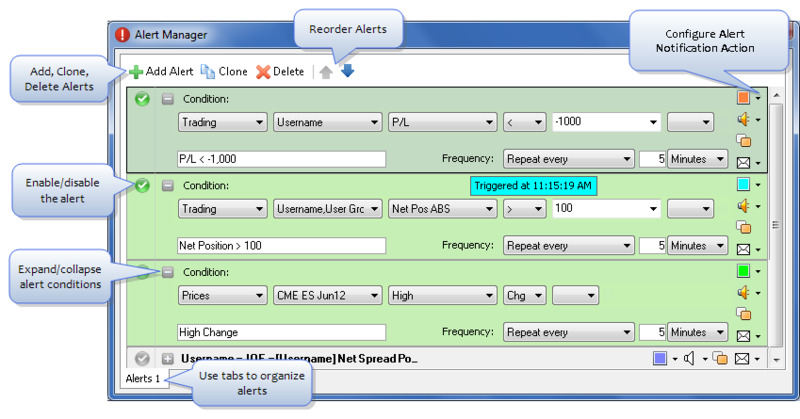 You can access the Alerts Manager window from the X_TRADER Control Panel by selecting (the Alerts Manager) icon. Define the logic that determines when an alert is triggered based on Prices, Fills, Trading, Orders, Events, or Time, set the type of alert notification, the frequency, and activate the alert. The Alert Managers window contains one tab when it is initially opened. Additional tabs can be added to organize alerts within a single workspace. The tabs can be renamed, cloned, and color-coded.